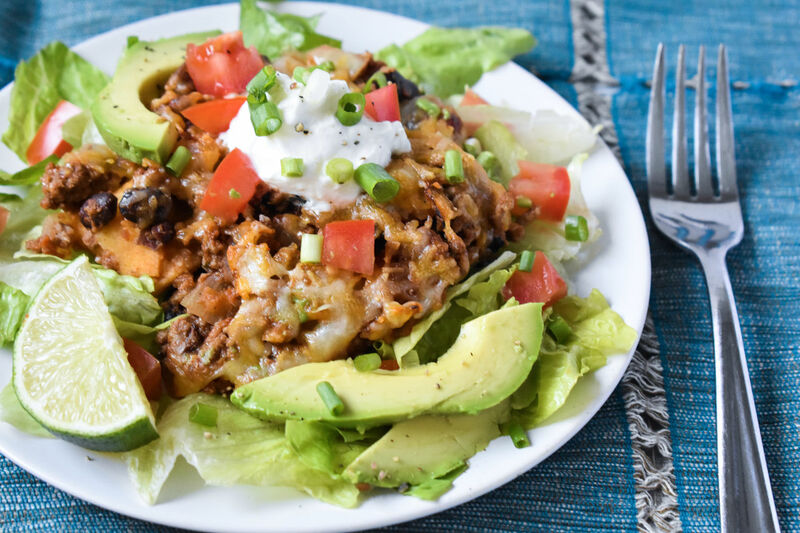 A lot of recipes for Southwestern-inspired casseroles are heavy in unhealthy carbs like tortilla chips and white rice, as well as high-fat cheese and sour cream. But in this version, whole-grain corn tortillas take the place of chips or white flour tortillas. This swap provides more fiber, fewer calories and carbs, and less saturated fat and sodium. Serves 8. Cut tortillas into ½ to 1-inch squares. Cover a sheet pan with foil; place cut tortillas on lined pan. Coat tortilla pieces with cooking spray; sprinkle with ⅛ tsp. salt, tossing to coat all pieces. Bake at 400 degrees for 12 minutes, stirring tortilla pieces every 3 to 4 minutes. (Tip: Watch pieces on edge to prevent excess browning.) Let cool. Heat nonstick skillet over medium-high heat. Add ground beef and onion. Cook, stirring to crumble beef, 7 minutes or until beef is no longer pink. Drain any excess liquid; return meat mixture to skillet. Add taco seasoning, stirring well. Add beans, tomatoes, salsa and lime juice. Cook 1 to 2 minutes or until warm throughout and slightly thickened. Sprinkle half of toasted tortilla pieces in the bottom of a 13-by-9-inch baking dish coated with cooking spray. Top with half of beef mixture, ¼ cup cheese, and remaining tortilla pieces. Add remaining beef mixture and sprinkle remaining cheese over top. Bake at 400 degrees for 15 to 20 minutes or until warm throughout and cheese is bubbly. Sprinkle with green onions. Let stand 5 minutes. Then cut into 8 pieces or spoon each serving over ½ cup chopped romaine lettuce. Calories 322; total fat 14g (saturated fat 6g); cholesterol 66mg; sodium 472 mg; total carbs 23g (dietary fiber 5g, total sugars 6g, added sugars 0g); protein 24g.